Note: This is a re-post in honor of the 225 Anniversary of George Washington’s First Inaugural Address. The debate was over. The arguments had been presented. The federalists supported this new document because they believed it was necessary for this young nation to prosper. On the other hand, the anti-federalists feared that the new constitution gave to much power to the federal government. Would states lose their autonomy once this new document was ratified? After four grueling months of debate the new constitution was ratified and the states had to decide who would be their first president. George Washington was chosen unanimously as the new nation’s first president without a single dissenting vote. Now once again, after wishing to end his life of service to his country and retire back to his farm, Washington again answer’s the call to serve his country. For George Washington was truly a man who did not seek power. In fact, he detested power. He sought personal honor. But he never sought accolades. He believed in service to his country. It was time for George Washington to go to the new nation’s capital, which was in New York, and accept another responsibility and trust that was bestowed upon him. For George Washington was truly a man whom was trusted by the people of the United States. For the thirteen states would have never accepted the new constitution if Washington had not given it his seal of approval. The young nation feared a strong central government. They feared the new Constitution would create a government that would trample on their rights. They feared another monarchy. For what good was the revolution if a new monarchy at home would replace the old monarchy abroad? The thirteen states were apprehensive at first in ratifying this new Constitution. And there was only one man whom could put their minds at ease. That man was George Washington. The only man whom they would entrust with this new power. Washington gave the very first presidential oath and the very first inaugural address. On that cool, April Day in New York City Washington also followed in the footsteps of the Biblical heroes of old making a covenant with God. David. Solomon. Josiah. God honors covenants. He would always keep His end of the bargain. George Washington knew that. The question is would the United States of America keep hers? Robert Livingston administered the very first presidential oath of office of this new nation. He was New York’s state Chancellor. Washington then bent over and in an act of reverence for His God whom saved him so many times before, he kissed the Bible. In his address Washington made it clear that no nation can expect to be blessed by God (propitious smiles of Heaven) if they turn away from Him. (disregards the eternal rules of order and right) If a nation forgets God she will lose the blessing that God has given her. Representing the nation, Washington made a promise that the United States of America would follow God. If she ever broke her promise then she would lose God’s blessing and protection. God would keep His promise. He always kept His promises. Only one question remained: Would the United States of America keep hers? Note: This is the final part in a 3 part series that discusses the book “7 Men: And the Secret of Their Greatness”. As a baseball fan I was ecstatic to find out that the great Jackie Robinson was included in this book. I already knew about the greatness of his athletic abilities and the persecution he endured as Major League Baseball’s first African-American ballplayer. What I was not aware of was his tremendous Christian faith. As a matter of fact, Jackie Robinson’s faith was the reason Brooklyn Dodger’s owner Branch Rickey chose him to break the color barrier. Rickey knew that the first African-American player, whomever he was, would not be able to endure the abuse that he would suffer. That is, he would not be able to endure the abuse hurled at him without God’s help. It was important to find a man who would not fight back when called names that are too terrible to write. If Jackie Robinson fought back, who knows how long it would take to break the color barrier? Jackie Robinson was just that man. Through a feat of supernatural strength that only can come from God, Robinson endured abuse that is too terrible to describe. As a non-Catholic whom has a great admiration and respect for the Catholic faith, I have long appreciated John Paul II. I remember where I was when I watched the funeral of this godly man and I will never forget the historical double papal canonization of Pope John Paul II and Pope John XXIII, which occurred just hours before writing this. Due to my age (I’m in my mid-20’s) I do not remember John Paul II during the beginning or middle of his papacy, but I do have a recollection of the last years of his life. It is his last years that I will always remember and how he was so dignified during his last days on earth. A major political debate during the end of John Paul II’s life was whether embryonic stem cells should be used for medical research. Despite the fact that this type of research could potentially save his life as he battled Parkinson’s disease (note: there has yet to be a scientific breakthrough with embryonic stem cells) John Paul II stood up against this immoral type of research. It would have been very easy for John Paul II to put his beliefs aside for the moment because this research may have benefited him. But he did not do so. John Paul II believed in defended the weakest among us and even when it was convenient to forget about his principles and look out for himself, he refused to do so. This is what I will always remember about John Paul II and why he was such an honorable man. Chuck Colson lived a “Tale of Two Lives”. During the first half of his life, Chuck Colson worked his way up the ladder until he was appointed to special counsel of the most powerful person in the world, Richard Nixon. Colson’s only objective in life was the culmination of power and he was willing to step on anybody in order to help the president. Everything changed with Watergate. In politics, when scandal happens, someone has to be made a scapegoat and in the case of the Watergate scandal, that someone was Chuck Colson. After leaving the White House and returned to his law practice, Colson’s life began to change forever. Ongoing investigations into the Watergate scandal began to affect Colson’s life and it was at this point that he was confronted by a client, Tom Phillips, about faith. Phillips then began to share the good news with Colson. Phillips quoted Psalm 37 to Colson and also shared Jesus’ famous words in John 3 which says, “Very truly I tell you, no one can see the kingdom of God unless they are born again.” It was this moment that changed Chuck Colson’s life forever. After surrendering his life to God, Chuck Colson became a target of special prosecutor Leon Jaworski, who wanted to destroy Chuck Colson for his involvement in the Watergate scandal. Jaworski was willing to offer Colson a deal, however. Colson was offered the opportunity to plead guilty to a misdemeanor charge of conspiracy to break into the offices of the psychiatrist of Daniel Ellsberg (the author of the Pentagon Paper’s), even though he never committed this crime. It would have been easy for Colson to plead guilty to this charge and avoid facing charges that could have led to even greater prison time, but Colson could not do this. How could he lie? Chuck Colson gave his heart to God. How can reconcile a lie with his new faith? After refusing the plea deal, Colson was indicted on felony charges. Then things really started to spin out of control. Secret tapes of Colson’s conversations were released to the media. A media circus ensued. Colson knew that, even though he was innocent of the crimes he was being accused of, he still had contributed the culture of corruption that existed in the White House. The only way Colson could be true to his new faith was to confess to the crimes he had committed and put his faith in God that everything would work out in the end. So Chuck Colson became a modern-day Jean Valjean. After confessing, Colson thought that the judge might show him some leniency and mercy, but just the opposite occured. Colson ended up being sentenced to one to three years in prison, a draconian sentence considering the circumstances. However, Colson didn’t lose his faith in God and believed it was God’s will for these events to transpire. The judge didn’t give Chuck Colson grace and neither did the media. The media assumed that Colson had an angle; after all, wasn’t it convenient that Colson had suddenly became a Christian. However, this is a major misconception regarding the life of Chuck Colson that exists even to this day. Colson had become a Christian prior to facing any criminal charges and in no way tried to manipulate the media or the court regarding his faith. In reality, it was his faith that led him to plead guilty in the first place. After serving his time in prison and serving God in prison, Chuck Colson returned to civilian life. He never forgot his fellow inmates and dedicated the remainder of his life to helping those in prison by starting an organization called Prison Fellowship. Chuck Colson also became involved in an ecumenical outreach between Protestants and Catholics. There is much that divides Protestants and Catholics. Instead of looking at the issues that divides these faiths, Chuck Colson attempted to focus on the things that unites Protestants and Catholics. He did this by starting the wonderful organization Evangelicals and Catholics Together. And on a personal note, Chuck Colson’s important work is partially why I have become more ecumenical over the years. Finally, Chuck Colson was a prophet of sorts. Chuck Colson was able to see the direction the country was heading and realized, before most did, that the fundamentals of the Christian faith would be under attack by the state. Along with Robert George and Timothy George, Chuck Colson drafted the Manhattan Declaration, a document that proudly affirmed the Church’s stance on the trio of important issues, which include the sanctity of life, the dignity of marriage, and freedom of religion. If you have not heard of the Manhattan Declaration and have not signed it, please do so! I thank God for the example of these great men. It is easy to ask God, “why aren’t there more men like George Washington, William Wilberforce, Eric Liddell, Dietrich Bonhoeffer, Jackie Robinson, Pope John Paul II, and Chuck Colson?” It is much more difficult to become these type of men. I’m not suggesting that we should be exactly like these men, for each of us are unique and were created by God for a special purpose. I’m also not suggesting we idolize these men. Not only is that sin, but it is counterproductive. These were great men, but they each had flaws as well. But these men do have a lot to offer us today. They showed us that we can overcome impossible circumstances as long as we remain obedient to God. They showed us that if you live a life of honor, integrity, compassion, humility, and love you can change the culture. They also showed us courage. I will close by quoting the author of 7 Men: And the Secret of Their Greatness, Eric Metaxas, who beautifully explains what it really means to be courageous. These seven men exhibited this idea of courage in their lives and we can too! So whom are these Seven Men? George Washington was great for a myriad of reasons. He led our country through the Revolution, a time of great pain and suffering for the colonists. Today we like to think that the war went smoothly and it was an easy victory against tyranny. The reality was just the opposite. Everything seemed to be going the British’s way in the war. Washington lost battle after battle and it was looking like the war was a lost cause. If we were living in the colonies in the 1770’s we probably would have given up hope. But Washington refused to do so. With the help of Divine Providence, the tide was able to turn and of course the rest is history. William Wilberforce grew up in a very non-Christian environment in England. He was exposed to Methodism briefly during his childhood but eventually fell away from the faith that he was introduced to. As a member of Parliament William Wilberforce was a thorough going pagan. That all changed when he went on a trip with an old friend, Isaac Milner. Milner was a Christian but Wilberforce appeared to not be aware of this. On the trip Milner intellectually explained the Christian faith to a skeptical Wiberforce. By the time the trip was over Wilberforce could not deny that what Milner said was true. Wilberforce had to decide what to do with the rest of his life. How can he remain in Parliament, an institution with morals that makes today’s Congress look like Mother Theresa? Wilberforce decided to visit his old mentor, the hymn writer John Newton, for some advice. It would have been very easy for Newton to advise Wilberforce to leave Parliament because it was “evil.” But Newton did not do this. Newton encouraged Wilberforce to remain in Parliament because he could be used as an instrument of God in order to enact change. Wilberforce did just this. Due to Wilberforce’s obedience to God the world was literally changed! I must confess, prior to reading this book I didn’t know a lot about Eric Liddell. I had seen the classic movie “Chariots of Fire”, but besides this I was unfamiliar with Liddell. After all, how accurate was this movie anyway? If you’ve seen “Chariots of Fire” then you know about Eric Liddell the Olympic athlete. Training his whole life for the 100-meter race, Eric Liddell made a sacrifice that few, if any of us would be willing to do? After finding out that his best race was scheduled on a Sunday, Eric Liddell had to choose between obeying his God by honoring the Sabbath or giving in to the pressure put on him by his country. Liddell decided to honor the Sabbath and run a different race, the 400 meter, a race he was not trained for. It is because of Liddell’s ultimate decision that he is known by us today. This victory in the 1924 Olympics was not the end of Liddell’s story, however. Liddell became a missionary in China and continued to make sacrifices. But this time for the Kingdom of God! These are perhaps the most famous words ever said or penned by the great 20th century German theologian and pastor Dietrich Bonhoeffer. As Adolph Hitler was rising to power in Germany, a seminary student named Dietrich Bonhoeffer began to form his theological beliefs. A prolific intellectual, Bonhoeffer managed to get his first doctorate degree at the impressive age of 21. Yes, you read that correctly. 21. Unable to be ordained in the German Lutheran Church due to age restrictions, Bonhoeffer decided to study abroad in Spain, Rome, and the United States. It was in Berlin that Bonhoeffer became a theologian. It was in New York City that Bonhoeffer became a disciple. While in the U.S., Bonhoeffer was invited to attend Abyssinian Baptist Church in Harlem and fell in love with the Lord’s Church. While Bonhoeffer was in America the Nazi’s were increasing their power in Germany. By the time Bonhoeffer returned to his homeland everything had changed. Bonhoeffer found himself in opposition to the Third Reich and even the German Lutheran Church. Bonhoeffer was in opposition to the Third Reich for obvious reasons. They were anti-Jewish and had a different idea of Germany than Bonhoeffer. Bonhoeffer strongly believed that it was the job of the Christian to present the gospel to the Jew as well as the Gentile.This was no longer possibly as long as the Nazi’s were in power. Bonhoeffer also denounced publicly the idea of the “Fuhrer Principle”. The “Fuhrer Principle” (Fuhrer being the German word for leader) was the antithesis to Christianity. The idea of a strong Germany with a strong leader whom could solve all of Germany’s problems was appealing, but Bonhoeffer wanted nothing to do with this idea of Germany. Bonhoeffer found himself in opposition to the state church as well. The German Lutheran Church had kowtowed to Hitler and the Nazi policies and simply refused to take on the anti-Christian government. Hitler intended to take over the Lutheran Church systematically and Bonhoeffer was able to recognize this early on. Ultimately, Hitler intended to be the true object of worship and wanted to replace the church with the worship of the state. Not able to change the trajectory of the church, Bonhoeffer started the “Confessing Church”, a church that intended to follow the scriptures instead of following Hitler. Bonhoeffer also took the call of God “to make disciples” very seriously. In fact, discipleship was the very foundation of Bonhoeffer’s ministry. It was enough to simply be a good German Lutheran anymore. If Germany was to change; if Germany was to be transformed into a nation that pleased God, then it was necessary for Christians to be obedient to the call of God. This emphasis on making disciples and making disciples whom would also go and make disciples was the reason Bonhoeffer decided to defy Hitler and start an illegal seminary in Finkenwalde. Now this is the part of a Bonhoeffer’s life that turns into a spy novel. For much of his life in ministry Bonhoeffer struggled with the role of the Christian and what, if anything the Christian can do in opposition to the state. After much prayer and meditation, Bonhoeffer concluded that there are three things that the Church must do when the state turns against God. First off, the Church must help the state to understand that they have stepped out of line and have transcended their jurisdiction. In an ideal world, the state would acquiesce to the Church and all would be made right again. In the real world, this rarely happens. Therefore, the Church has to do more than simply declare to the state that they have sinned against God. The Church must also help the victims of the state. For Bonhoeffer, this meant helping the Jews. It wasn’t enough for the Church to help the victims, however; the Church must also act in order to prevent the state from victimizing more people. And this is where Bonhoeffer’s story gets really interesting. It wasn’t enough for Bonhoeffer to speak out in defense of the victims of the Nazi’s, Bonhoeffer had to also act. Bonhoeffer had the opportunity to act against the Nazi’s when he was recruited by his brother-in-law to join the Abwehr, a military intelligence agency similar to the CIA. Bonhoeffer’s official job in the Abwehr was to go around Europe selling the official Nazi position. However, what Bonhoeffer really did in the Abwehr was tell Allies that there were Germans living inside Germany who were working against Hitler and the Nazi government. This was the point that Bonhoeffer literally became involved in a conspiracy to end Hitler’s life by becoming a double agent. Of all the men in this book, Bonhoeffer’s story felt the most real to me, perhaps because of the urgency I feel in my own life. Though there are many differences between early 20th century Germany and America today, there are also many similarities. America has been moving away from God and this has allowed an opportunity for dangerous men and women in power to take advantage of the current culture. This happened in Bonhoeffer’s life and this is happening in America today. If you only have time to read about one man, please read about Dietrich Bonhoeffer. Note: Part 3 of this series will be an in-depth discussion on the lives of Jackie Robinson, Pope John Paul II, and Chuck Colson. Today I want to share with you an intellectually stimulating guide to manliness. What is a man? What makes a man great? These are the questions that Eric Metaxas, the author of an eclectic range of works, asks in “7 Men: And the Secret of Their Greatness“. Eric Metaxas’ resume includes children’s books such as “Veggie Tales” and the “Uncle Mugsy” trilogy, works of apologetics such as “Everything You Always Wanted to Know About God (but were afraid to ask)”, and the great biographies “Amazing Grace: William Wilberforce and the Heroic Campaign to End Slavery” and “Bonhoeffer: Pastor, Martyr, Prophet, Spy“. Mr. Metaxas once wrote commentaries for Chuck Colson and now gives commentaries at BreakPoint along with his colleague John Stonestreet. In addition to this, Mr. Metaxas also hosts “Socrates in the City“, a forum in New York City in which the great questions of life are examined. Past guests have included the Christian cultural author Os Guinness, the King’s College professor Joseph Loconte, and the biologist Dr. Stephen Meyer, among many others. Mr. Metaxas’ newest project is a Sunday morning show called “100 Huntley Street” which he co-hosts. Unlike other morning shows, 100 Huntley Street discusses topics from a Christian point of view. Suffice to say, Mr. Metaxas has done a little bit of everything. If you can’t already tell, I am a big fan of Eric Metaxas. I first came across Mr. Metaxas when I read his important biography “Bonhoeffer: Pastor, Martyr, Prophet, Spy” and have been following his career ever since. It was this book that introduced me to the great German theologian and pastor Dietrich Bonhoeffer. It was this biography that started my journey into the life of Dietrich Bonhoeffer, a man whom I call a hero. I often even hear myself asking, “What would Dietrich Bonhoeffer do in this situation?” or “What would Bonhoeffer think about what is going on in the world?”. After hearing Mr. Metaxas speak at the 2012 National Prayer Breakfast, in which his topic was “Dead Religion”, I decided to read “Amazing Grace” and also fell in love with William Wilberforce. These are heroes that we need to know for they have answers to the problems that we face and we must utilize their solutions. The problem is many people will not sit down and read a 600 page biography on any man, no matter how interesting they may be. Though I do not relate to this sentiment, I can understand where they are coming from. However, when I heard that Mr. Metaxas wrote the book “7 Men: And the Secret of Their Greatness” I immediately became excited because I knew many others who would never read a long biography on Wilberforce or Bonhoeffer may be inclined to read a short chapter on their lives. This would mean that many, many more would also be introduced to these great men. They in turn may have their lives changed just like mine was when I was introduced to them. For the last 8 months I have had the privilege to lead a men’s group on this important book and have had a blast learning about and studying the lives of these great men. I sincerely hope that others will receive as much benefit from this book as I have. So what’s 7 Men really about? Well, in a nutshell it is about this: Our desperate need for heroes. We need heroes. Today it seems like there is a great lack of men who do the right thing for the right reason. Please don’t misinterpret what I just said. There are still good men and women. But for some reason our culture gets a kick out of destroying and tearing apart good men and women; people whom simply try to follow God as best as they can and live a life of honor and integrity. Whom do we want to emulate? Whom do we want our children to emulate? There are a lot of bad role models. We need some good ones! For this reason, it is an important exercise to study great men and women of the past and what made them great. 7 Men is a study that does just this. Note: The next post will be a discussion about the seven men that are included in this book. Britain is a Christian Nation and We are Too! Last week was Holy week, a time when Christians across the globe reflect on the great sacrifice of our Lord and Savior Jesus Christ and the eternal gift that He gave to each and every one of us. It was not a quiet Holy week however. While we were in church celebrating the risen Lord, across the Atlantic, Prime Minister David Cameron, the leader of our friends in the U.K., caused quite a hullabaloo. Mr. Cameron gave his annual Easter message, both in video and written form, and the social media world had a conniption. Letters were written in opposition to Mr. Cameron’s message. Outraged Atheists and secular humanists became hysterical. What was it that Mr. Cameron said that caused such an uproar? In a column he penned for the Church Times, an Anglican newspaper, Mr. Cameron had the audacity to claim that Britain is a Christian nation. Yes, you read that right. Britain is a Christian nation. Hasn’t anyone opened up a history book recently? Open up a history book about England and it doesn’t take long at all to run into Christianity. Remember, this is the same country that has a state church called “The Church of England.” This is the same country that had a reformation in which Henry VIII abolished the Catholic Church and made the Anglican faith the state religion. This is the same country that codified freedom of religion in the Magna Charta. Alfred the Great was a Christian. Richard III was a Christian. Queen Elizabeth was a Christian. Winston Churchill was a Christian. Margaret Thatcher. Tony Blair. And the list goes on and on. Sure, many of these Christian leaders weren’t very good men and women. They didn’t appear to be very good representatives of the Christian faith. Then again, who is. The reality is we all have our shortcomings. After all, we are all sinners and fall short of the glory of God. But despite all of this, how can anyone argue with a straight face that Judeo-Christianity did not influence England? This is effectively what Mr. Cameron’s detractors are saying. In an open letter titled “David Cameron fosters division by calling Britan a ‘Christian country’“, which appeared at the Telegraph, a group of 57 men and women chastised Mr. Cameron for recognizing his nation’s history. Here in America, when Christians have the audacity to say that we are indeed a Christian nation this objection is often brought up. A lot of people in American are not Christians. How can we be a Christian nation? On the surface this makes sense. However, the intelligent person will ask what is a Christian nation? What does it mean to be a Christian nation? The truth is being a Christian nation has more to do with a nation’s heritage then a nation’s current demographics. It doesn’t matter if 51 percent of the people were atheists. We would still be a Christian nation. Even if there was only a single Christian left in the United States of America we would still be a Christian nation. So how can I say this? It’s simple. The United States of America was built on Judeo-Christianity. The legal system was based on the legal system from the Bible. The Constitution is filled with clauses taken directly from the Bible. The Ten Commandments influenced the early institutions formed by the founding fathers. Moses had a greater influence on this great nation than Aristotle. Locke had a greater influence on this nation than Plato. So, if you believe America is not a Christian nation just know this. You are in disagreement with Benjamin Franklin, George Washington, and Thomas Jefferson. You are in disagreement with the executive branch, the legislative branch, and the judicial branch. It might be controversial in the year 2014 to tell the truth by boldly claiming, “Yes, America is indeed a Christian nation.” It may be controversial, but it is no less true. Christianity has had a substantial influence on America; and that may be the understatement of the century. You might not like it. You might disagree with Christianity. You might think Christianity is a myth. You might even think Christianity is a joke. But you CAN NOT argue with history. To Mr. Cameron’s detractors I say this. Yes, Britain is a Christian nation. And we are too! Who do you say I am? Jesus asked this very question of his disciples 2,000 years ago. He asks us this same question today. Tomorrow April 20 is Easter. On this day over a billion Christians all over the globe will be celebrating Jesus’ great victory over death. Resurrection Sunday commemorates the day Jesus gave us the greatest sacrifice that has ever been given in the history of mankind. The Greek language calls this sacrifice Agape love. It was Agape love that led Jesus to come to Earth and it was Agape love that led Jesus to sacrifice His life for ours. Agape love. And it was because of this Agape love that we can have a new life. Resurrection Sunday is a reminder for us to throw away the old and embrace the new. In 2 Corinthians 5:17 we are reminded that if we put our hope and faith in Jesus Christ He will make us a new creation. However, it is only do to Jesus’ Divinity that we can even have our sins forgiven. If Jesus was simply a man His sacrifice would have been meaningless. But Jesus isn’t simply a man, He is God in the flesh. Who do you say the Son of Man is? He is the Christ, the Son of the living God! The founding fathers of America were not oblivious to this fact. They too recognized the humanity of Jesus. However, they also recognized the Divinity of Jesus as well. Academics often argue that the Founders were deists whom did not recognize Jesus’ Divinity. 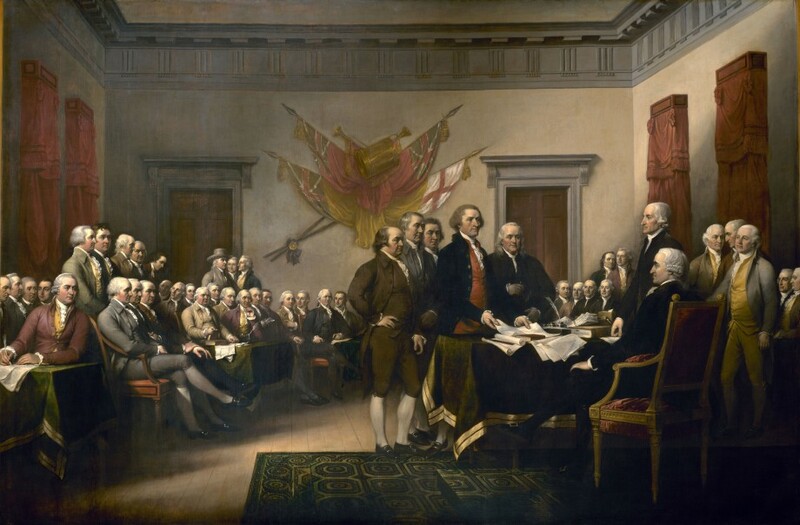 According to their understanding of America’s patriarchs, these men did not believe in a personal God who hears or answers the prayers of man. They believed in God but they certainly did not believe that God was active in their lives. This is demonstrably false. It is true that some of the founders were deists. However, the majority believed in an active God who passionately cared for His creation. And the majority also believed in the Divinity of Christ. Here is a small selection of quotes by some of the Founding Fathers regarding their understanding of the Divinity of Jesus. On the mercy of my Redeemer I rely for salvation and on His merits, not on the works I have done in obedience to His precepts.ii Charles Carrroll, Signer of the Declaration of Independence. John Hancock called on the State of Massachusetts to pray . . . Many, many more quotes are available by the founders regarding their understanding of the nature of God. Pages and pages of writing could be filled just listing quotes from the founders mentioned in this post and others who were not mentioned. Space does not permit me to quote every single founding father. The majority of the Founding Fathers clearly knew who the Son of Man is. Now, what about you? Who do you say the Son of Man is? i As cited by David Barton, http://www.wallbuilders.com/LIBissuesArticles.asp?id=8755#FN9, From the Last Will & Testament of Samuel Adams, attested December 29, 1790; see also Samuel Adams, Life & Public Services of Samuel Adams, William V. Wells, editor (Boston: Little, Brown & Co, 1865), Vol. III, p. 379, Last Will and Testament of Samuel Adams. ii As cited by David Barton, http://www.wallbuilders.com/LIBissuesArticles.asp?id=8755#FN9, From an autograph letter in our possession written by Charles Carroll to Charles W. Wharton, Esq., September 27, 1825.
iii As cited by David Barton, http://www.wallbuilders.com/LIBissuesArticles.asp?id=8755#FN9, John Witherspoon, The Works of John Witherspoon (Edinburgh: J. Ogle, 1815), Vol. V, p. 255, Sermon 15, “The Absolute Necessity of Salvation Through Christ,” January 2, 1758.
iv As cited by David Barton, http://www.wallbuilders.com/LIBissuesArticles.asp?id=8755#FN9, John Hancock, Proclamation for a Day of Public Thanksgiving, October 28, 1784, from a proclamation in our possession, Evans #18593.
v As cited by David Barton, http://www.wallbuilders.com/LIBissuesArticles.asp?id=8755#FN9, William Jay, The Life of John Jay (New York: J & J Harper, 1833), Vol. I p. 518, Appendix V, from a prayer found among Mr. Jay’s papers and in his handwriting. vi As cited by David Barton, http://www.wallbuilders.com/LIBissuesArticles.asp?id=8755#FN9, Kate Mason Rowland, Life of George Mason (New York: G. P. Putnam’s Sons, 1892), Vol. I, p. 373, Will of Colonel George Mason, June 29, 1715 .
viii As cited by David Barton, http://www.wallbuilders.com/LIBissuesArticles.asp?id=8755#FN9, Lewis Henry Boutell, The Life of Roger Sherman (Chicago: A. C. McClurg and Company, 1896), pp. 271-273.
ix Fitzpatrick, John C., The Writings of George Washington, Vol. 15: Speech to the Delaware Chiefs, http://etext.virginia.edu/etcbin/ot2www-washington?specfile=/texts/english/washington/fitzpatrick/search/gw.o2w&act=surround&offset=18502434&tag=Writings+of+Washington,+Vol.+15:+SPEECH+TO+THE+DELAWARE+CHIEFS&query=jesus+christ&id=gw150049. Note: This is part 1 of a series of articles on American Exceptionalism. Part 1 will lay out the modern view that America is not and never has been exceptional. This is a view clearly not shared by the Founding Fathers and early Americans. Continuing articles in this series will explain the meaning of the phrase “American Exceptionalism” and what this phrase means for us today. Syrian dictator Bashar al-Assad felt empowered. His reign of terror had to be stopped. But the Syrian rebels were no better. There is still disagreement as to whom the aggressor was. The use of chemical weapons was the last straw. In America war drums were beating. President Obama approached Congress asking for permission to strike Syria. He later dithered and asked Congress to delay the vote. Then fortune shined on the White House. Russia’s foreign minister convinced Syria to turn over and destroy their stockpile of chemical weapons. In America war drums were no longer beating. The day was saved thanks to Russia. Feeling that the United States was not thoroughly humiliated Russian President Vladimir Putin delivered another blow. But this time with a pen. In Putin’s mind the verdict was clear. America is no longer exceptional. A few weeks ago, conservative commentator and founder of TheBlaze, Glenn Beck, held a week-long event in Salt Lake City called “The Man in the Moon.” Focused on the importance of remembering the past so we do not make the same mistakes in the future, Beck ended a week of activities by telling the history of man from the perspective of the man in the moon. Beck, along with historian David Barton, also included a museum called “Independence Through History”. Containing items from their personal collection along with items loaned by others, the Independence Through History exhibit included such items as Abraham Lincoln’s desk, William Bradford’s Bible, Martin Luther King’s last letter, Arnold Friberg’s “The Prayer at Valley Forge” painting, and George Washington’s compass. In contrast to these items the museum also included warnings from history such as journals from the Salem witch trials, documents from the Spanish Inquisition, slave shackles, John Wilkes Booth’s manifesto, and a first edition of Mein Kampf. In response to this display art historian Alexandra Karl wrote a hit piece in the Salt Lake Tribune titled “Karl: Glenn Beck’s Nazi Exhibit” in which she libelously excoriated Beck as a “sympathizer rather than a critic” of Nazism. Karl falsely claimed that the Independence Through History museum “offered no connection between these items and the early Americana nearby” and even maligned those who attended this museum stating that “Beck’s displays were met with complete apathy by the citizens of Salt Lake City. Visitors wound their way through the room in an almost robotic torpor, demonstrating neither revulsion nor too much interest either.” Full of factual mistakes and untruths Karl later admitted privately that she never attended this museum. The prophet Isaiah also instructed Israel to “Remember the former things long past” [Isaiah 46:9]. Likewise, the Apostle Paul told the church in Rome that “For whatever was written in earlier times was written for our instruction, so that through perseverance and the encouragement of the Scriptures we might have hope” [Romans 15:4]. History is our roadmap. We have a tendency to only want to study positive role models such as George Washington and Martin Luther King. It is good to study the successes of history for we can take many positive lessons and apply them to our lives and world. It is also important to study the dark moments of history so that we remember exactly how those events happened so they do not happen again. The Holocaust could have been avoided if only people recognized the warning signs that they were given. It is imperative that we study the good, the bad, and the ugly of our history. There is a lot we can learn from George Washington, William Wilberforce, and Dietrich Bonhoeffer. There is also a lot we can learn from Benedict Arnold, Adolph Hitler, and Maximilien de Robespierre. Study the lives of great men and study the lives of evil men so we do not repeat the same mistakes from the past! [ii] William Wirt, Sketches of the Life and Character of Patrick Henry (Philadelphia: James Webster, 1818), p. 120, speech given in Virginia on March 23, 1775. In 1996 two Cornell scholars, Isaac Kramnick and R. Laurence Moore, published a book that had a profound effect on political science and Constitutional literacy. In “The Godless Constitution: The Case Against Religious Correctness”, Kramnick and Moore make the argument that America was founded as a secular nation and the framers of the Constitution believed in a strict separation of church and state. In their view, religion should be completely absent from the public square because the founders wanted it this way. The Constitution is a secular document; God is completely absent from this legal contract. [i] Nearly twenty years old, this book still is impacting our modern society; it is frequently cited as the authoritative treatise on our founding fathers and the government that they gave us and is still currently used in college courses throughout the country. Despite being published, this book would have received a failing grade if it was assigned as a term paper in any university, community college, or frankly even high school. Why? Because, as everyone who has ever written a research paper knows, you have to cite your sources. In fact, this isn’t optional. Kramnick and Moore chose to avoid using citations. Instead of listing sources to defend the claims that they made, at the end of the book they simply wrote “we have dispensed with the usual scholarly apparatus of footnotes.”[ii] Translation: America was founded as a secular nation and even though we don’t have the evidence to prove it you should trust us because we have PhD’s and wouldn’t lie to you. Incidentally, this lack of scholarly integrity is one of the reasons why I strongly believe in the use of primary sources to defend the claims one makes. My focus here isn’t to critique “The Godless Constitution” or even the widely used historical practice of Academic Collectivism, which is the tendency to put more weight on what other academics say opposed to the use of primary sources. Instead I use “The Godless Constitution” as an example of this incorrect and all too common view of American history and Constitutional jurisprudence. Instead, my focus is to show that the framers of the Constitution clearly understood the positive affect that a Biblical worldview has on a nation’s laws and government. I will show that the framers looked to the Old Testament when forming this nation’s government, especially the Book of Deuteronomy. Like modern taxation, which is used to pay for social programs, the tithe was also used in this way. The only difference is that God required the tithe, not civil government. God also shows no favoritism. The tithe was uniform; if you made $1 million you paid ten percent. If you made $10,000 you paid ten percent. Likewise, the Constitution allowed Congress to create a capitation tax, which is “an assessment levied by the government upon a person at a fixed rate regardless of income or worth.”[iii] This capitation tax was levied equally on every person. If a person made $1 million they paid the same tax rate as someone who made $10,000. Obviously, as anyone who understands modern taxation knows, the government no longer taxes us in the same way. Instead of a capitation tax the government uses what is known as progressive taxation. Under a progressive tax, the tax rate increases as one’s annual income increases. The lower one’s income, the lower one’s tax rate. On the other hand, the higher one’s income the higher tax rate an individual has to pay. This system of taxation is not Biblical and it is not what the framers of the Constitution envisioned. The death penalty is not a light topic. I realize that many who are reading this may be against the death penalty while others support it. The issue here is not if the death penalty should or should not be legal but what evidence is necessary to execute a person who commits a capital crime; specifically treason. In Ancient Israel a person who committed a capital crime (a crime that can be punished by death) could not be executed unless at least two witnesses could testify that they saw them commit their crime. Human nature as it is, God understood the importance of creating protections against the abuse of power and the depravity of man. There have always been people who have it out against someone and whant them to suffer. This protection decreases the likelihood that an individual can be executed because someone doesn’t like them or because they were in the wrong place at the wrong time. There certainly were and are still false witnesses but their stories usually fall apart in court when questioned by attorneys and judges. The Constitution incorporated this verse from Deuteronomy, attributing it to the crime of treason. In the case of treason, one could not receive the death penalty unless they either testified to the crime (which is rare) or if two or more people witnessed the same act. The Constitution therefore uses the same protections that God required of Ancient Israel. For much of its history Israel did not have a king. The last verse of the Book of Judges declares: “In those days there was no king in Israel; everyone did what was right in his own eyes.” [Judges 21:25] While other nations were ruled by kings Israel was ruled by judges. [iv] Do to the people’s frustration of the way the Prophet Samuel’s sons (who were appointed as judges of Israel) behaved, the people of Israel demanded a king. [v] It is important to note that God never required Israel to have a king; in fact He strongly desired that Israel not choose a monarchy as its form of government. [vi] However, God has given us free will and many times we choose what’s harmful to us as both individuals and a society; as was the case when Israel demanded a king. God knew Israel would one day demand a king and He created an important requirement that all future kings would have to meet. [vii] The king was required to be a natural born citizen or “countrymen”. God knew that it was important that this stipulation be put in place because a foreigner would destroy the culture and heritage of Israel by defiling her with foreign gods, rituals, and practices. A “natural born citizen” would be more likely to follow the laws of God. By studying the Old Testament it is clear that foreigners defiled Israel with false gods and even the natural born citizens refused to follow the laws of God. The Constitution also requires the head of the executive branch to be a “natural born citizen”. In their education, the framers of the Constitution studied history and the books of the Bible and it was abundantly clear that nations suffered when foreigners ruled them. By placing this Biblical requirement on the head of the executive the founders were attempting to protect this nation for generations to come. After being freed from slavery in Egypt, Moses began to lead the Hebrews to the Promised Land. Unfortunately, he ran into many problems along the way and needed some advice. Moses father-in-law Jethro, noticing all of the responsibilities that Moses had and all of the disputes that were brought to him, gave Moses a piece of advice. Jethro realized that Moses would never be able to handle all of the problems that occurred between the Hebrews by himself and suggested that Moses “select out of all the people able men who fear God, men of truth, those who hate dishonest gain; and you shall place these over them as leaders of thousands, of hundreds, of fifties and of tens.” [Ex. 18:21] As the head of civil government in Israel, it was too much for Moses to handle everything that came his way. Instead, it was preferable for Moses to divide the responsibilities among many different people who were wise and knew God’s laws. Today we call this a republican form of government. We are not a democracy; we elect individuals to represent us and our interests. One man or woman is elected by the people to represent each district; this man or woman represents 600,000 or so constituents. Exodus 18 is an example of a republican form of government; a form of government that has proven throughout history to create the greatest amount of stability and prosperity. The Constitution guarantees that every state in this country would have this same form of government that is found in Exodus 18. It was quite clear from both past experiences and simple common sense that man loves power and too much power invested in one office will lead to doom and gloom. To decrease the likelihood of this happening three branches of government were created: the executive branch (Article 1), the legislative branch (Article 2) and the judicial branch (Article 3). The legislative branch was given the most power because it is closest to the people and the judicial branch was given the least power because it is farthest from the people. By dividing up the power into three branches the likelihood of creating a prosperous country with stability and freedom for many generations was greater. This idea of separation of powers came from experience and historical literacy but also from the Bible. Isaiah 33:22 declares: “For the Lord is our judge, The Lord is our lawgiver, The Lord is our king….” The Lord is the great judge (Judicial branch), the creator of law (Legislative branch) and the king (Executive branch). God Almighty can have all this power because only He has pure motives and can be trusted with this power. No man can be trusted with all this power because “The heart is more deceitful than all else And is desperately sick…” [Jeremiah 17:9]. Man’s natural state is to do evil and cannot be trusted with absolute power regardless how well intentioned they may be. Constitutional Principle #7: The Soul Who Sins Should Be Punished; the Son Will Not Be Punished. In Ezekiel 18:20 God clearly holds the individual and only the individual responsible for his or her sin. The son is not responsible for his father’s sin and the daughter is not responsible for her mother’s sin. Only the soul who sins will die. It would be unjust if the nation’s laws would hold the son or daughter responsible for their parent’s crimes. The framers of the Constitution understood this principle in Ezekiel 18 and detested the practice of English law to disallow children from inheriting property if and when their fathers committed a capital crime. Everyone who has taken a civics class should know and understand the process that allows laws to be created. When a bill is passed by Congress the president has the power to sign the bill or veto the bill. However, the bill automatically becomes law after ten days even if it is not signed by the president. The framers incorporated the Sabbath Day into this clause by not counting Sunday as one of the ten days that the president has to veto a bill. Since Sunday is the Sabbath for Christians government was closed on this day and no work was to be done. This is just one of the many clauses that show that the framers understood and respected the Bible. The Sabbath is a holy day and it belongs to God! The framers of the Constitution clearly used the Bible as a source as they were creating this great document. This is not surprising when one considers the love and respect that these great men had of Christianity and the words and teaching contained in The Holy Bible. It is therefore impossible to believe that the framers intentionally created a godless document and advocated a strict separation of church and state. The founders understood the great wisdom and truths taught in the Bible and the importance of organizing our society around these truths! [iii] “Capitation Tax,” The Free Dictionary (at http://legal-dictionary.thefreedictionary.com/Capitation+tax). [iv] See the Book of Judges. Israel was ruled by many judges; Gideon and Samson are more familiar examples of these leaders but there were also many others. [v] See Samuel 8. Notice that the Israelis clearly asked for a king; it was not God’s idea. Interestingly, the kings of England (especially King James) used this passage as justification for their rule claiming that God preferred the monarchy. [vi] See the warning God gives Israel in Samuel 8:10-18 over the consequences of choosing a king. [vii] It should also be understood that in addition to being a natural born citizen the king would also expected to follow God’s laws. Of course this usually did not happen. [viii] There is a vast amount of information on Lord Acton at http://www.acton.org/pub/religion-liberty/volume-2-number-6/power-corrupts. [xi] “Bill of Attainder,” The Free Dictionary (at http://legal-dictionary.thefreedictionary.com/bill+of+attainder). [xii] Joseph Story, Commentaries on the Constitution of the United States (Boston: Hilliard, Gray, and Company, 1833), Vol. 3, pp. 170-171, Chapter XXVIII: Power of Congress to Punish Treason, S1294. [xiii] Story, Commentaries on the Constitution of the United States, Vol. 3, pp. 171-172, Chapter XXVIII: Power of Congress to Punish Treason, S1294-1295. [xiv] For a more thorough explanation of the attestation clause in Article 7 see “Attestation Clause,” The Heritage Guide to the Constitution (at http://www.heritage.org/constitution#!/articles/7/essays/137/attestation-clause).